From the department of “stuff to get excited about even though it won’t be available for a long damn time, and we’re an instant-gratification culture that can barely comprehend the thought of something we have to wait for”— a.k.a. 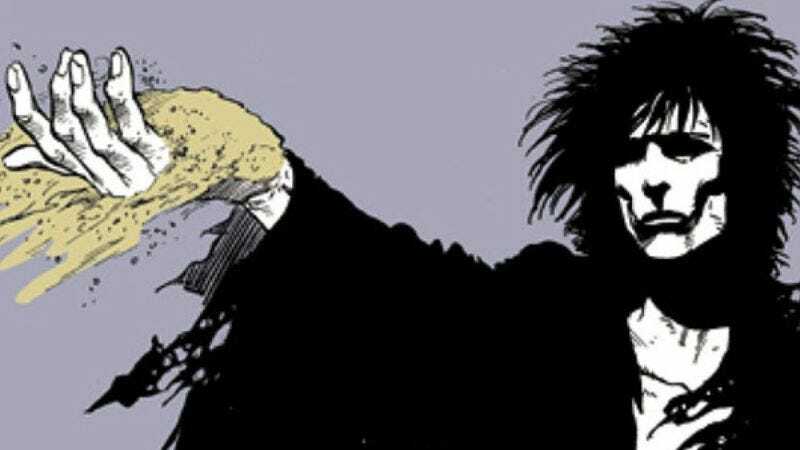 “most of the news out of Comic-Con”—Neil Gaiman announced Thursday that he's writing a prequel to his groundbreaking, industry-changing Sandman comics series. The as-yet-untitled miniseries is planned for a 2013 release, to coincide with the series’ 25th anniversary. It will fill out a story alluded to a couple of times throughout the Sandman series, about a battle that Morpheus, the embodiment of dreams, fought in a distant galaxy, leaving him weakened enough that a mere mortal with a spell was able to capture him in a bottle at the beginning of the series’ first book, Preludes & Nocturnes. In an announcement made from DC Comics headquarters in New York—about as far as he could possibly get from Comic-Con while remaining in America, for which no one blames him—Gaiman said he felt like he “failed” when writing the original series because he never managed to fit this particular story in, so he’s looking forward to finally getting it out there. The story will be illustrated by Eisner and Harvey award-winning artist J.H. Williams III (Promethea, Desolation Jones, Batwoman). DC’s follow-up press release describes it as a digitally released multi-issue miniseries rather than a book, but given that it’s Gaiman, there’s no chance in hell DC will fail to release it in a physical format, in pill form, or in any and every other way people will buy it. The announcement overshadowed another Gaiman-related story that broke yesterday in The Guardian, noting that he’s also just signed a deal to write three more children’s novels—including a sequel to his 2010 kids’ book Odd And The Frost Giants—and two picture books for pre-literate kids, about a sneezy panda named Chu. And buried within that news story is an announcement ported over from Gaiman’s immensely popular blog, where he revealed he’s written a new adult novel that’s “lurching further toward the end of its second draft every day,” and that’s also due out in 2013. Essentially, our long national nightmare of not having a new Neil Gaiman novel since 2008—or a new Sandman book since 2003—will eventually come to an close, if we can all agree to ignore the Mayans and not end the world this year.